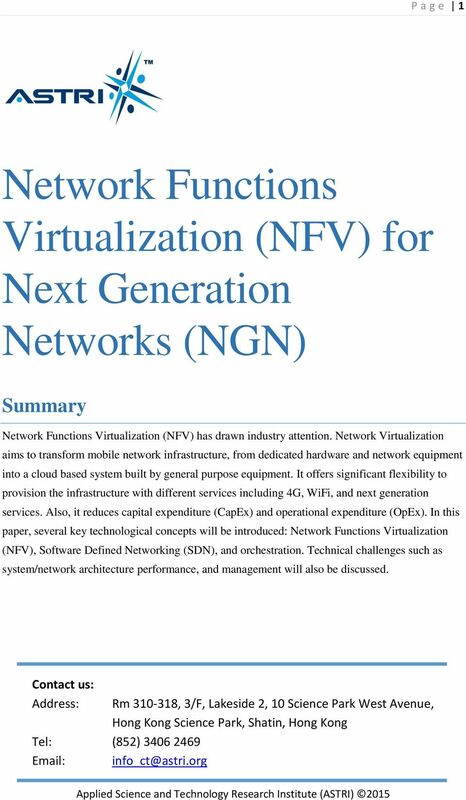 Download "Network Functions Virtualization (NFV) for Next Generation Networks (NGN)"
2 P a g e 2 Acronym ASTRI ATCA DPACC DSC EPC GW HA IMS IPSec LTE MANO NFV NFVI OPNFV SDN SFC VM VNF Applied Science and Technology Research Institute Advanced Telecommunications Computing Architecture Plane Acceleration Dynamic Service Chaining Evolved Packet Core Gateway High Availability IP Multimedia Subsystem Internet Protocol Security Long Term Evolution Management and Orchestration architectural framework Network Functions Virtualization Network Functions Virtualization Infrastructure Open Platform for NFV Software-Defined Networking Service Function Chaining Virtual Machine Virtual Network Function Concept of NFV and SDN Some key technologies are driving the transition from today s network infrastructure into a cost-effective virtualized solution. The two most important technologies are NFV and SDN. 1) Network Functions Virtualization (NFV) is a network architecture concept that proposes using IT virtualization related technologies to virtualize entire classes of network node functions into building blocks that may be connected, or chained, to create communication services . 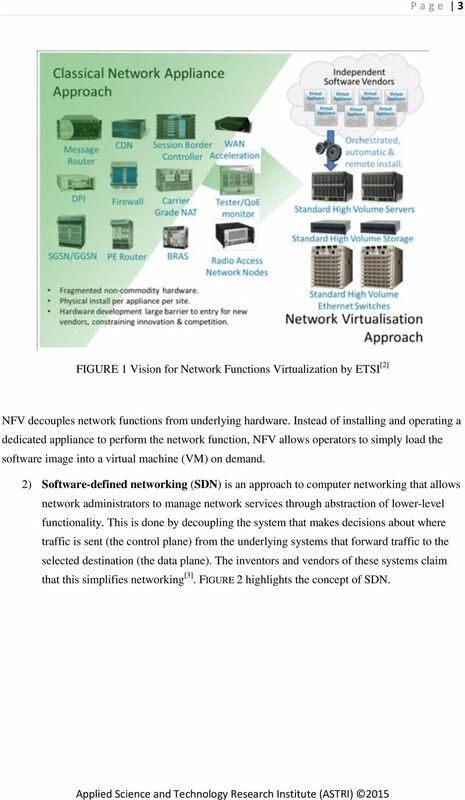 FIGURE 1 shows the vision for Network Functions Virtualization by ETSI . 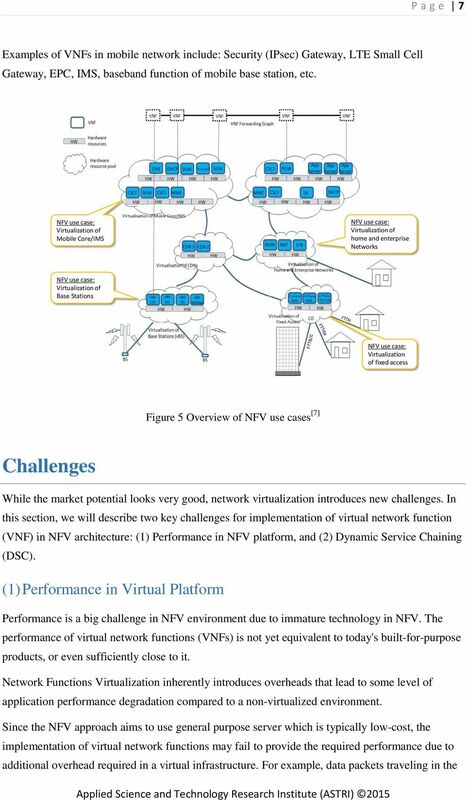 3 P a g e 3 FIGURE 1 Vision for Network Functions Virtualization by ETSI  NFV decouples network functions from underlying hardware. Instead of installing and operating a dedicated appliance to perform the network function, NFV allows operators to simply load the software image into a virtual machine (VM) on demand. 2) Software-defined networking (SDN) is an approach to computer networking that allows network administrators to manage network services through abstraction of lower-level functionality. This is done by decoupling the system that makes decisions about where traffic is sent (the control ) from the underlying systems that forward traffic to the selected destination (the data ). The inventors and vendors of these systems claim that this simplifies networking . FIGURE 2 highlights the concept of SDN. 5 P a g e 5 cost. Operators must offer new and innovative services to drive revenue and stay competitive. Also they have to deliver these services quickly with cost under control. Figure 3 Projected revenue vs. cost structure of service providers (Intel)  In telecom industry, each generation of operator s networks has its dedicated hardware and network infrastructure. Services are coupled to these hardware equipment and physical network topology. To launch a new service often requires another variety of dedicated hardware & changing the network topology. This is costly and complicated. The concept of NFV is about to do network functions in software. It is one of the emerging technologies which leverage IT cloud computing and server virtualization techniques. NFV will enable operators to deploy network services dynamically in software without having to make changes to network at the hardware level. You can spin up a virtual network like you can spin up a virtual machine. The virtual networks can reuse physical resources, and offer the flexibility of providing various virtual network functions, for example NAT, DHCP, load balance, and firewall, security appliance. That also greatly simplifies the underlying physical network as it only need to provide L2/3 connectivity. SDN and NFV have been viewed as the technological trends for Telecom industry. 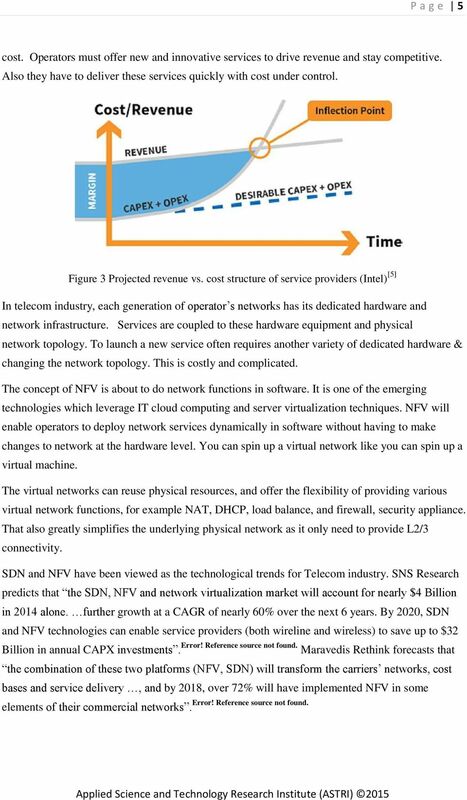 SNS Research predicts that the SDN, NFV and network virtualization market will account for nearly $4 Billion in 2014 alone. further growth at a CAGR of nearly 60% over the next 6 years. By 2020, SDN and NFV technologies can enable service providers (both wireline and wireless) to save up to $32 Billion in annual CAPX investments. Error! Reference source not found. Maravedis Rethink forecasts that the combination of these two platforms (NFV, SDN) will transform the carriers networks, cost bases and service delivery, and by 2018, over 72% will have implemented NFV in some Error! Reference source not found. elements of their commercial networks. 6 P a g e 6 NFV Architecture and Use Cases in Mobile Network The European Telecommunications Standards Institute (ETSI) has defined the NFV framework which consists of three main components: 1. Network function virtualization infrastructure (NFVI) is the totality of all hardware and software components which build up the environment in which VNFs are deployed. The NFV-Infrastructure can span across several locations. The network providing connectivity between these locations is regarded to be part of the NFV-Infrastructure. 2. Virtual network functions (VNF) are software implementations of network functions that can be deployed on a NFVI. 3. Network functions virtualization management and orchestration architectural framework (NFV-MANO Architectural Framework) is the collection of all functional blocks, data repositories used by these functional blocks, and reference points and interfaces through which these functional blocks exchange information for the purpose of managing and orchestrating NFVI and VNFs. Figure 4 Simplified ETSI ISG defined NFV framework  In summary, the building blocks for both the NFVI and the NFV-MANO is the NFV platform. In the NFVI role, it consists of both virtual and physical processing and storage resources, and virtualization software. In its NFV-MANO role it consists of VNF and NFVI managers and virtualization software operating on a hardware controller. The NFV platform implements carrier-grade features used to manage and monitor the platform components, recover from failures and provide effective security - all required for the public carrier network. 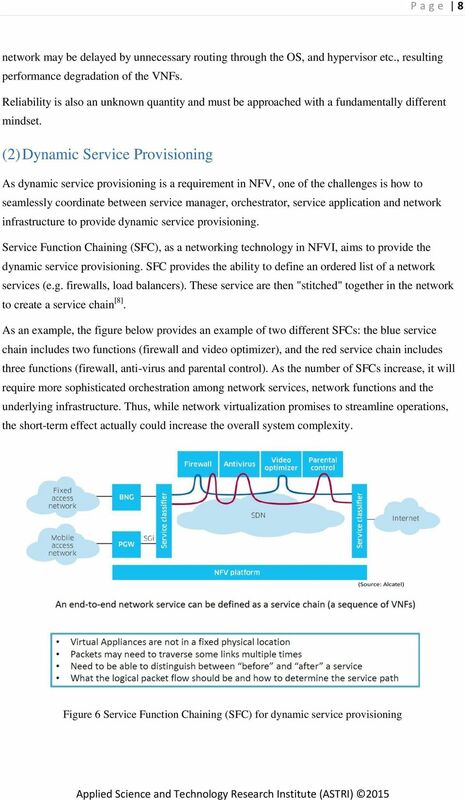 9 P a g e 9 (3) NFV Network Operation and Management With the approach of NFV and SDN, service providers can assemble service function chains through software configuration without physically installing appliances and without rewiring or manually-reconfiguring network connectivity. However, services now become applications running on virtual machines. This raises several challenges. Firstly, since all virtual appliances are in the cloud (not in a fixed physical location) and may be dynamically located, mechanisms are required to locate (dynamically) the VMs carrying on the service tasks. Secondly, there is a lack of mechanism to distinguish between before and after a service. 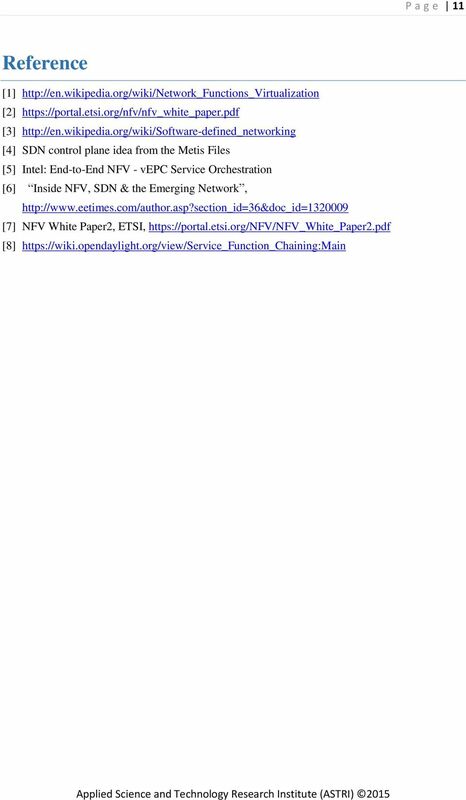 In addition, packets may need to traverse some links multiple times. How a service path of a logical packet flow can be determined? ASTRI s NFV Technologies ASTRI has developed production-ready mobile core network solution 1. Evolved Packet Core (EPC) 2. LTE Small Cell Gateway 3. Security (IPSec) Gateway 4. WiFi Access Controller (AC) 5. WiFi/4G Convergence Gateway 6. FastGate - ASTRI s multicore packet process software (gateways enabling module) 7. 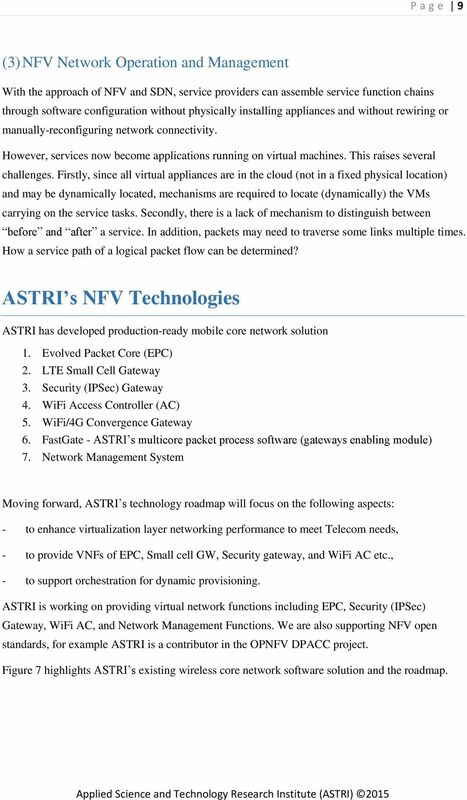 Network Management System Moving forward, ASTRI s technology roadmap will focus on the following aspects: - to enhance virtualization layer networking performance to meet Telecom needs, - to provide VNFs of EPC, Small cell GW, Security gateway, and WiFi AC etc., - to support orchestration for dynamic provisioning. ASTRI is working on providing virtual network functions including EPC, Security (IPSec) Gateway, WiFi AC, and Network Management Functions. We are also supporting NFV open standards, for example ASTRI is a contributor in the OPNFV DPACC project. 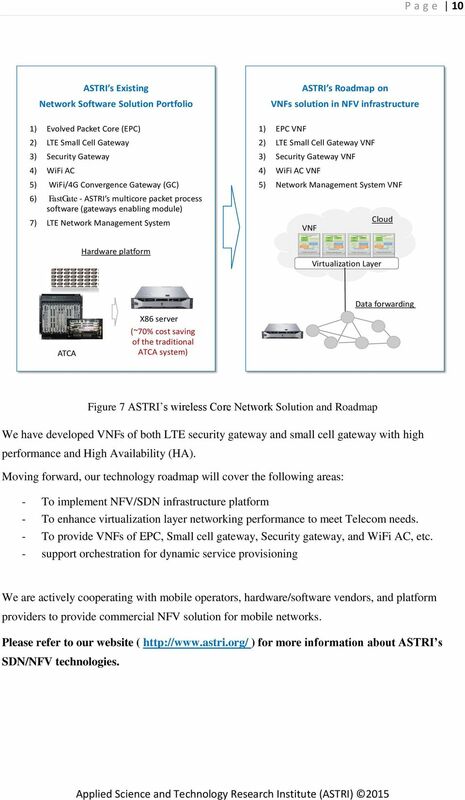 Figure 7 highlights ASTRI s existing wireless core network software solution and the roadmap. 10 P a g e 10 ASTRI s Existing Network Software Solution Portfolio ASTRI s Roadmap on VNFs solution in NFV infrastructure 1) Evolved Packet Core (EPC) 2) LTE Small Cell Gateway 3) Security Gateway 4) WiFi AC 5) WiFi/4G Convergence Gateway (GC) 6) FastGate - ASTRI s multicore packet process software (gateways enabling module) 7) LTE Network Management System 1) EPC VNF 2) LTE Small Cell Gateway VNF 3) Security Gateway VNF 4) WiFi AC VNF 5) Network Management System VNF Cloud VNF Hardware platform Virtualization Layer forwarding ATCA X86 server (~70% cost saving of the traditional ATCA system) Figure 7 ASTRI s wireless Core Network Solution and Roadmap We have developed VNFs of both LTE security gateway and small cell gateway with high performance and High Availability (HA). Moving forward, our technology roadmap will cover the following areas: - To implement NFV/SDN infrastructure platform - To enhance virtualization layer networking performance to meet Telecom needs. - To provide VNFs of EPC, Small cell gateway, Security gateway, and WiFi AC, etc. - support orchestration for dynamic service provisioning We are actively cooperating with mobile operators, hardware/software vendors, and platform providers to provide commercial NFV solution for mobile networks. 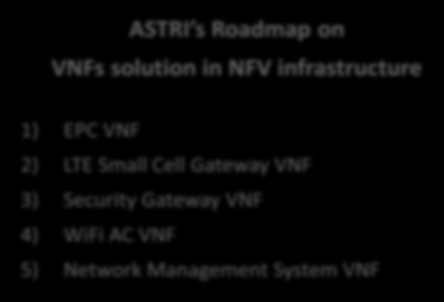 Please refer to our website ( ) for more information about ASTRI s SDN/NFV technologies. Expert Reference Series of White Papers. Is Network Functions Virtualization (NFV) Moving Closer to Reality? Network Functions Virtualization and Diameter Signaling Controllers. Enabling the telecom network migration to the Cloud!